As you may have guessed, I have A LOT of clothes. And to be honest, it can sometimes get overwhelming staring into a closet full of stuff when I’m trying to find something to wear. Over the past few months, I’ve been on a mission to pare down my wardrobe by either selling or donating the things I don’t love. I decided to take things a step further by clearing out my closet completely (don’t worry, it was just for the weekend) and seeing what I could do with only 10 items. It took me about 45 minutes or so to narrow down my selection, but once I did it was pretty easy to come up with different combinations (I had at least another week’s worth of outfits that didn’t make the cut!). The final verdict: It was almost therapeutic only having to consider a few items at a time. Looking at a near-empty closet was also strangely appealing. While I won’t be tossing out the rest of my duds any time soon, I have been adopting a more minimalistic approach to shopping (although shoes will always remain a vice). 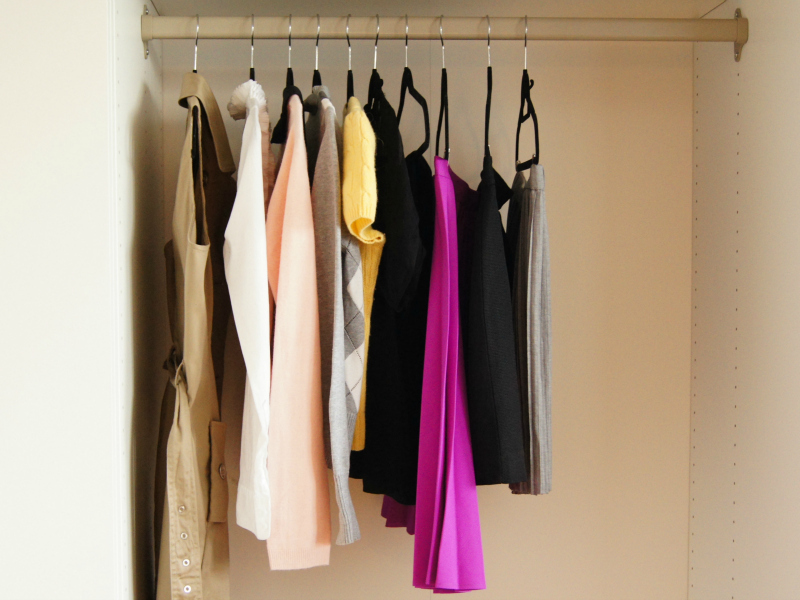 And I will definitely put my 10-item wardrobe to good use when packing for my next vacation! 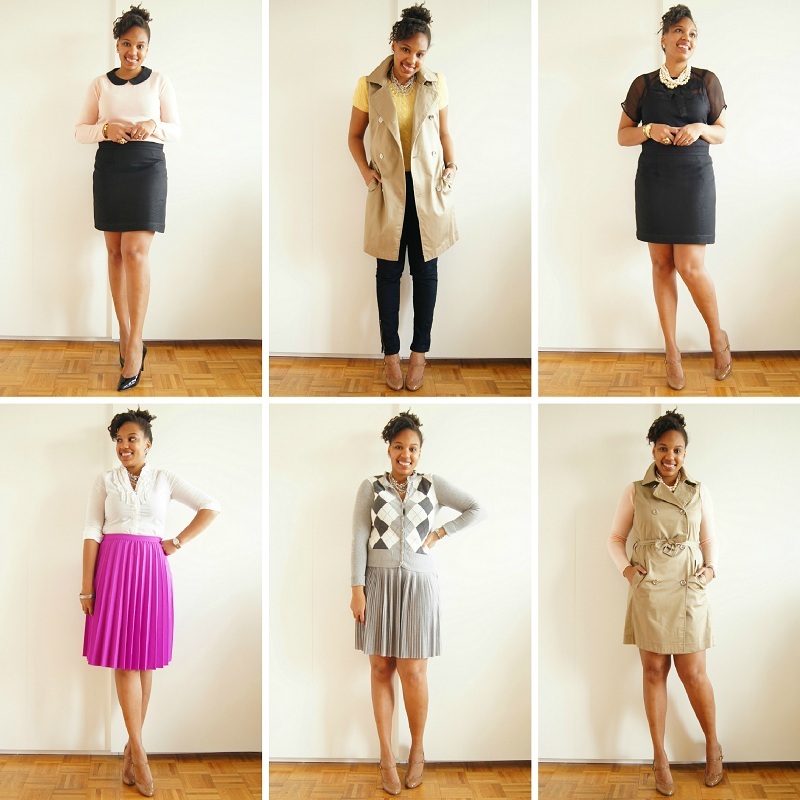 Detailed outfit shots and step-by-step instructions for creating your own 10-item capsule wardrobe after the jump! Start off with your favorite pair of jeans. Mine are a pair of dark skinnies with ankle zips that I purchased from Forever 21 a few years ago and have served me very well. Choose a color theme. You’ll notice that I pretty much stuck to neutrals and threw in a few bright colors (pink, purple and yellow) that all work well together. Pick 3 additional bottoms (at least 2 should be in a neutral color like black, grey or beige). I’m partial to skirts over pants (although my much-loved pair of black skinny cords almost made the cut), but choose whatever’s most comfortable for you. 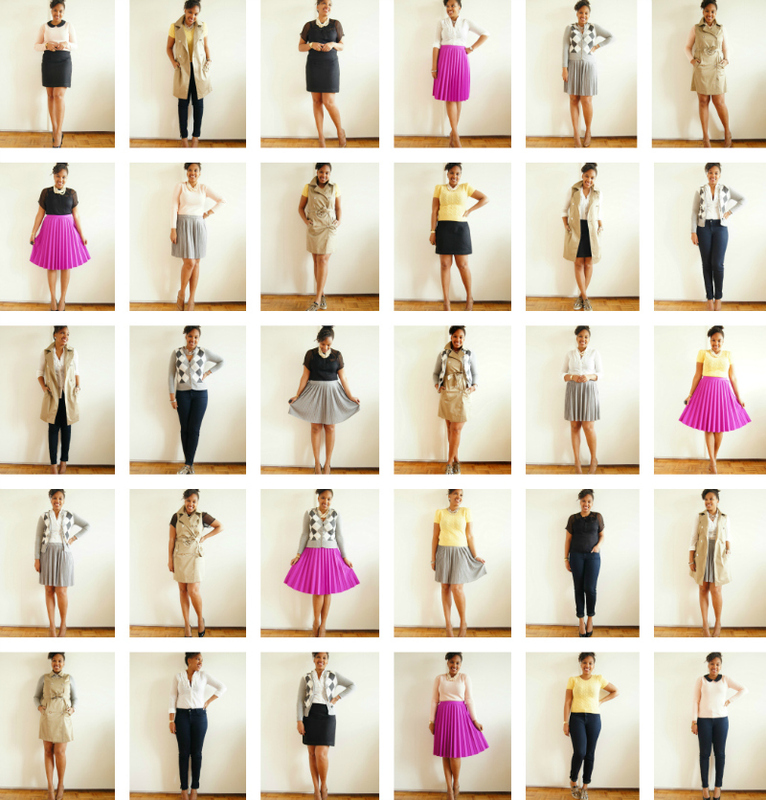 Pick out a fabulous dress that can be worn different ways. I went with a trench dress that turned out to be extremely versatile, but a button-front shirt dress could work well or perhaps even a lightweight knit dress that can be worn with a sweater and/or blouse on top. 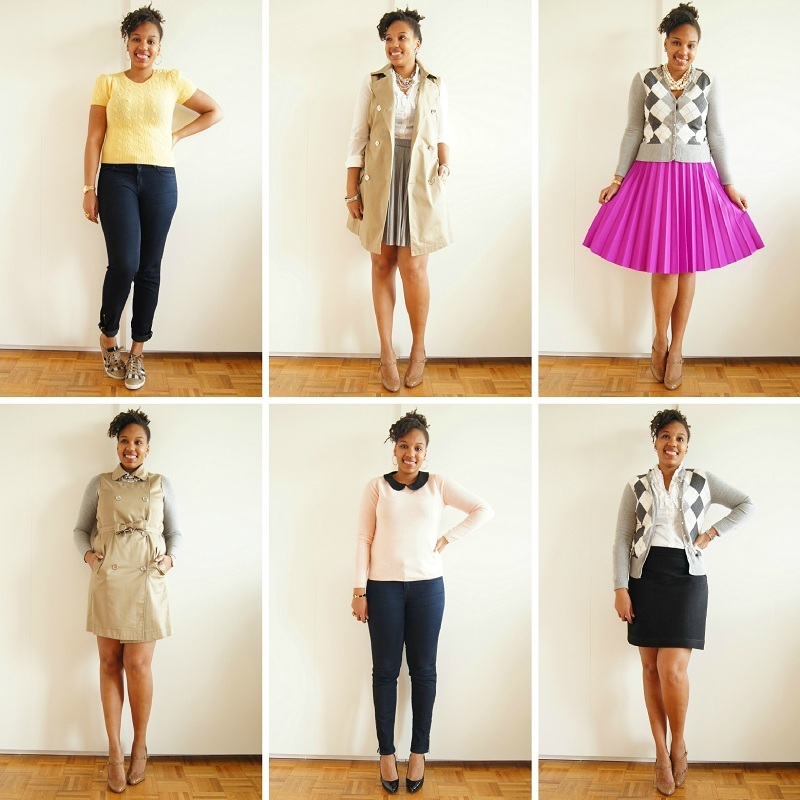 Choose whatever combo of cardigans and blazers (1 of each, or 2 of one) that floats your boat. I bent my own rule a little bit here by only choosing 1 cardigan (and no blazer), but that’s because my trench dress also served dual-purpose as a topper. For your 3 tops (or 4, if you’re a rule-breaker like me) choose items that can easily pair with all of your bottoms. It’s your call, but I highly recommend a white button-up blouse (or even a chambray if you prefer a more casual look). 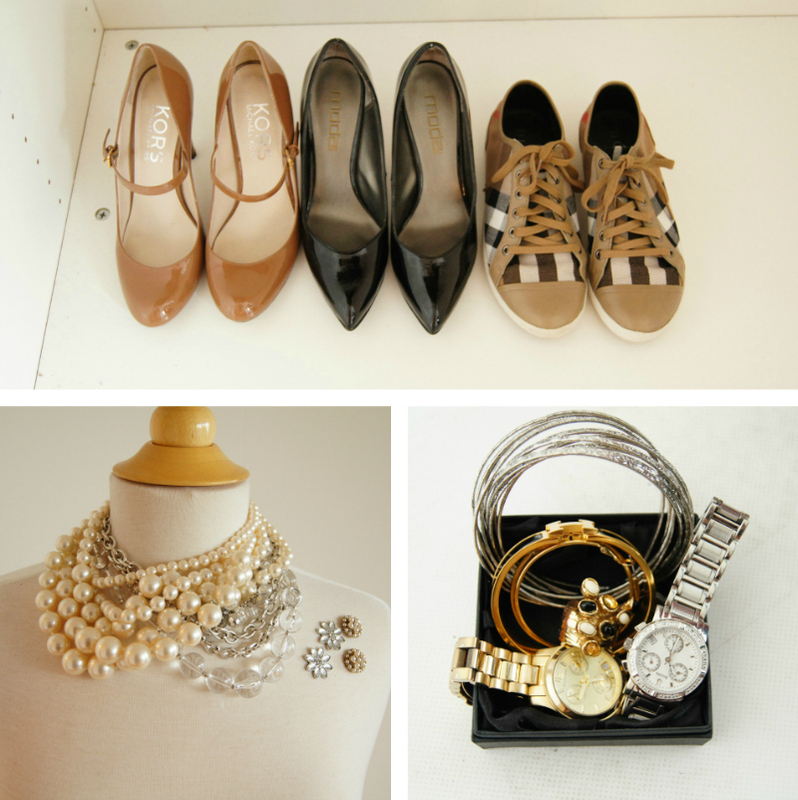 As you can see, I kept it pretty simple: 3 pairs of shoes and just a handful of my favorite baubles.